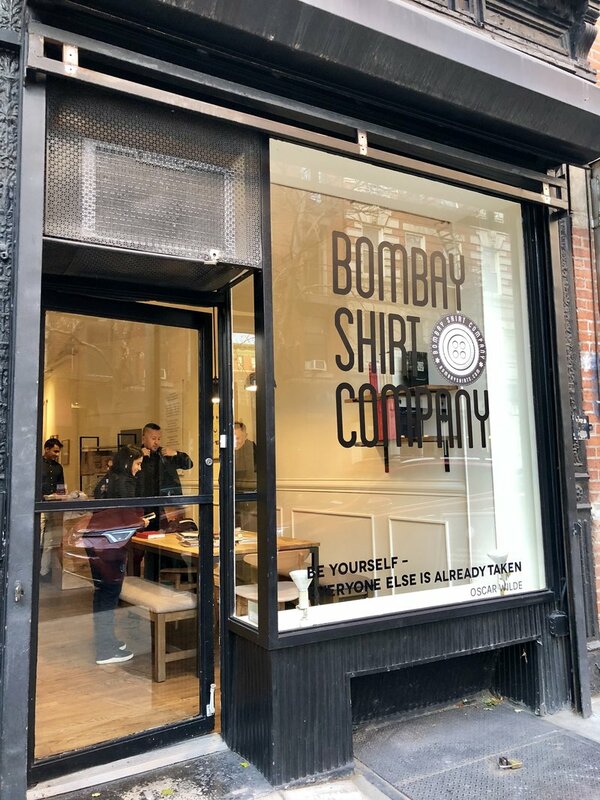 Bombay Shirt Company has opened a flagship store in New York. It is the first North American location for the Bombay, India-based bespoke shirt manufacturer. 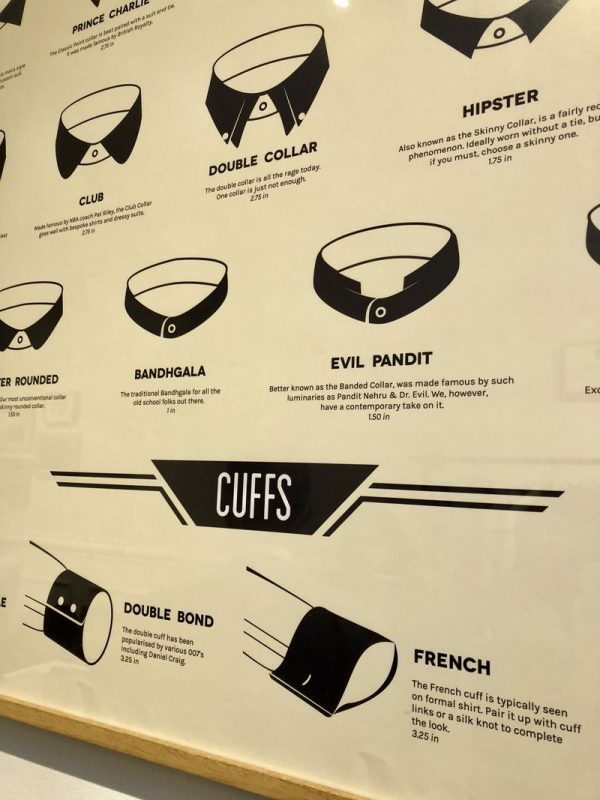 The Bombay Shirt Company is unlike all other custom shirt companies, as its customers select from a wide range of custom details, from the type of cuff they want to the collar and cut they prefer, without affecting the price of the shirt or delaying the two week delivery time. The store is located at 223 Mott Street in SoHo. Marrying contemporary product design and technology with old school tailoring techniques, customers can design and personalize a shirt from an extensive selection of options for both casual, business and formal occasions. Indeed, at the store or on the company’s website, customers select the options, such as the style of cuff and collar they prefer, from a design chart and then choose the fabric they prefer from hundreds of samples. Customers work with experts to customize their shirts. The SoHo boutique is staffed by experts who measure each customer for the perfect fit and stylists who are trained in the intricacies of fabric and styling guide each customer through design options. The fabric selected is the price differential and a wide range of options are available. Shirts are priced from $59 to $1,200, depending on the fabric selected, with most shirts priced at under $200. The shirts are delivered approximately two weeks later, which is a remarkably fast turnaround time for a custom shirt company. 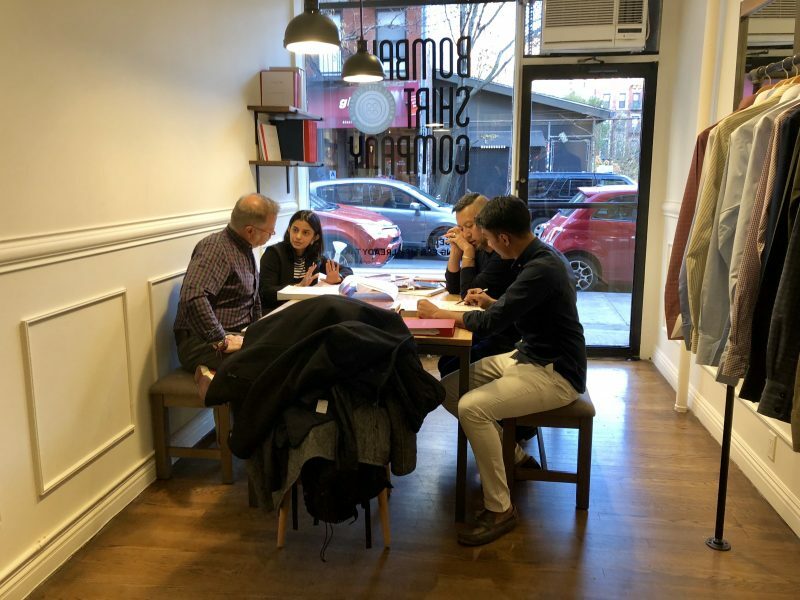 Bombay Shirt Company has simplified the reordering process, as a profile of each customer is created and his measurements are stored for the next time the customer places an order, whether it is placed online or at one of its stores. Likewise, if a customer has a shirt that fits well, he can send it to the company or bring it to one of its locations and its measurements will be taken and used for his Bombay Shirt Company orders. The Bombay Shirt Company offers a wide range of fabrics from which to choose. Launched in 2012, Bombay Shirt Company was founded by Akshay Narvekar, 35, and Simon Jacob, 36, who saw a need for their custom shirt company because of the cumbersome process they personally experienced while having their own shirts made in India. There, it is necessary to select and buy fabrics from a vendor before going to a tailor who then makes the shirt. “It is usually an extremely painful process,” says Jacob. “You have to spend a lot of time selecting fabrics and it is a hassle to find the ones you like.” Likewise it is difficult to find a tailor who offers a wide range of different design options. Launched in 2012, Bombay Shirt Company was founded by Simon Jacob (left) and Akshay Narvekar. The first year they received orders for five shirts a day and during the second year they opened their first store in Bombay. The business soon started to take off and they opened a second store in Bombay as well as stores in Delhi and Bangalore. Today, the company is averaging orders of more than 250 shirts a day. The majority of its stores are franchises and the company plans to continue to grow through franchising. Today, the company has six boutiques in India and one in Dubai in addition to New York. Boutiques will soon open in London and other cities around the world. And unlike any other custom handcrafted shirt company in the world, Bombay Shirt Company manufacturers everything in-house at several facilities in Bombay, so it is able to offer its shirts at the best possible price for its customers. The company does so in an innovative and socially conscious way, as well, as it provides local entrepreneurs with the micro-financing they need to set up factories that manufacture shirts for the company. Bombay Shirt Company offers a wide range of customizable options. A custom-made shirt with a 2-ply cotton fabric that is totally customized is priced as low as $79. A flannel-type fabric that is made in Japan would result in a shirt that would cost $129. There are also fabrics available from some of the most famous mills in the world. For example, a 300-thread count 2-ply bespoke fabric made of the finest yarns and Egyptian cottons possible might cost as much as around $1,200 per shirt. A selection of Bombay Shirt Company shirts. Ashesh Amin, who joined the company as a partner, is overseeing the North American operations. “We strongly believe that every man needs a custom shirt, he just has to own it, to know it and what better stage than New York City to roll out this venture,” he says. This year, Bombay Shirt Company is also launching the brand’s #shirtforBombaychildren campaign to help bring positive change to disadvantaged children. For every custom shirt order the company receives, Bombay Shirt Company will donate a new T-shirt to an underprivileged child in Bombay. The company has plans to add accessories, such as ties and cufflinks to its offerings, as well as a women’s line in the near future. For further information, visit the company’s website.